A Clarksville man -- who has proclaimed himself "King Michael" -- was in Baxter County Circuit Court Thursday facing charges of threatening to have Baxter County Sheriff John Montgomery, former Sheriff Benny Magness and a district judge executed. Forty-five-year-old Michael Thomas Curtis appeared on a video hookup from the Baxter County jail. Immediately on sitting down before the camera in the jail, Curtis launched into a disjointed and rambling discourse denying he had threatened anyone and proclaiming the emails containing threatening language did not come from him. When asked if he had retained a lawyer to represent him, Curtis said he did not need a lawyer because in addition to being a king, he was also a "justice and police officer." He was ordered to reappear in circuit court Jan. 17th. 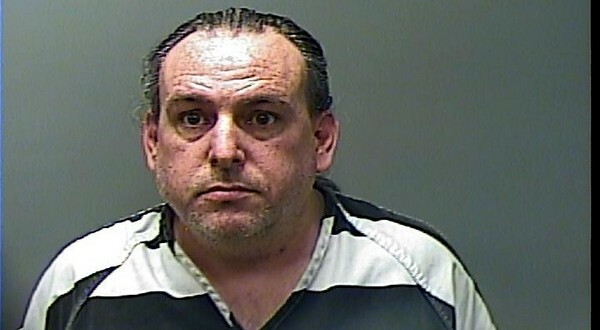 According to the probable cause affidavit, Curtis began sending a flurry of allegedly threatening emails to the Baxter County Sheriff's Office, after he was served with temporary orders of protection obtained by two members of his family -- his ex-wife who lives in Baxter County and an estranged daughter who is in college in another part of the state. He was served with the temporary orders in Clarksville Oct. 24th, according to Sheriff Montgomery. Following a hearing on Dec. 7th, the district court issued final orders of protection for both women effective through December 2023. Curtis did not attend the hearing, according to Sheriff Montgomery. Most of Curtis' communications were described as harassing in nature and incoherent in content. However, some of the messages did contain direct and specific threats against the officials. In one of the messages, Curtis referred to himself as "King Michael" and said he was giving orders and directives to President Donald Trump to have the executions of the officials in Baxter County carried out. One of his emails reads: The President of the United States of America orders the execution of Sheriff John Montgomery and Sheriff Benny Magness of Baxter County, Mountain Home, Arkansas, for the attempted murder and abduction by sheriff terrorism of King Michael Thomas Curtis of Johnson County, Clarksville, Arkansas, and his Queen Daughter. Both sheriffs are to be executed until dead as ordered by executive order of the President of the United States of America, Donald Trump. An arrest warrant was obtained Dec. 11th based on the threats and served on Curtis by the Johnson County Sheriff's Office. He was brought back to Baxter County and booked into the county jail with bond set at $50,000. The Johnson County Sheriff's Office also allegedly incurred Curtis' wrath for serving the papers on him. He began threatening personnel in that office with execution -- again on the orders of President Trump, according to Curtis. He accused officials in Johnson County of being in league with those in Baxter County in an attempt to murder "King Michael Thomas Curtis" and abduct his "queen daughter." The affidavits completed by his ex-wife and daughter as part of the effort to obtain protective orders to get Curtis out of their lives contain a number of bizarre claims and statements made by him to his wife and daughter. In one email allegedly sent by a person identified as special agent Michael Timothy Houston to Curtis' daughter, he wrote her father had left the U.S. for Greece and would not be returning. In another text, Curtis wrote he was angry with special agent Houston for telling his daughter a lie. He reported he was not in Greece, but still living in Clarksville. The daughter noted the special agent was, most likely, a figment of her father's imagination. In addition to calling himself a king, Curtis also claims to be a judge, an undercover justice and a Navy SEAL in his correspondence. In the affidavit for the protective orders, the ex-wife wrote her husband had been diagnosed as a paranoid schizophrenic. She said she felt he was apparently off his medications and not in his right mind. The daughter says in her affidavit she had been estranged from her father for several years. She said after starting college, she made an attempt to rebuild a relationship with her parent, but his messages became more and more strange. She described them as "rambling in nature and focused on religion, the stock market, and college scholarships." The daughter says she blocked her father from communicating with her in late June. Curtis is charged with two counts of terroristic threatening and threatening a judicial official or juror. All the charges are felonies. His bond is set at $50,000. The United State Secret Service was provided with information pertaining to the case and assisted with the investigation.